Here is another East Malling sketch courtesy of ebay. I have pasted the information left by the seller below. It always a good idea to copy these over from ebay for posterity, as once items are sold the drawings and information is taken off and threfore could be lost forever! Is anyone familiar with the building depicted or perhaps the artist? This drawing is currently for sale on ebay should anyone be interested in making a bid. 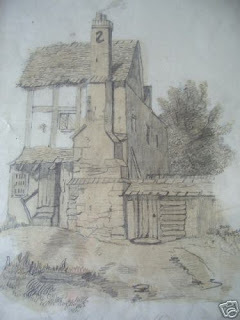 This fine example of a pencil and sepia wash drawing is of a dwelling in East Malling, Kent. The artist is D. Simpson and the work is dated 1865. The drawing measures 315mm by 240mm and the gilt wooden frame 410mm by 325mm.The drawing is clean and free from foxing. The wooden frame and glazing are of more recent origin and are intact and in good order.